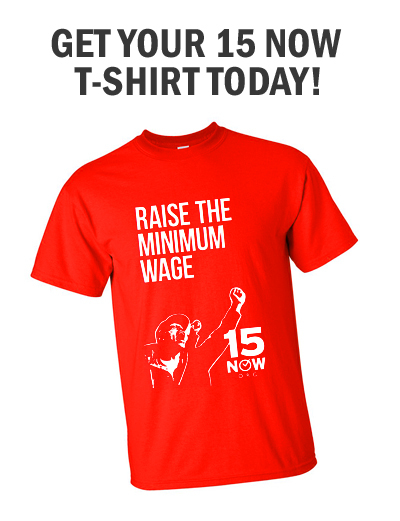 15 Now is urging SEIU, alongside the AFL-CIO unions, to link up the industry-specific “$15 and a union” campaigns with a mass campaign for a $15 an hour minimum wage in every city and state, and at the federal level. 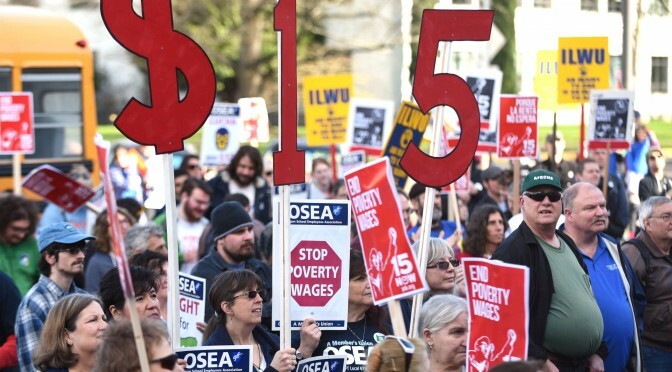 Uniting workplace organizing drives with the demand for $15 for all low-wage workers could bring far greater numbers into action, on April 15 and beyond. Given the concentration of communities of color in low-wage jobs, the call for a $15 an hour minimum wage could also attract youth radicalized around the #BlackLivesMatter protests. If the big unions adopted this approach, many big cities could see tens of thousands on the streets demanding a $15 an hour minimum wage and offering solidarity to low-wage union drives. Imagine if the big unions and groups like the NAACP mobilized an army of tens of thousands of volunteers and staffers, as they do for every big election, to build mass demonstrations on April 15 and further national days of action. As the victories for $15 an hour in Seattle and San Francisco show, a mass movement for $15 could win far more for working people than spending hundreds of millions on elections, often to back corporate-sponsored Democratic Party politicians. We can’t continue to let our unions put political loyalties above fighting for what workers need to survive. While many union leaders will demand McDonald’s and other employers pay $15, few put this same demand on city, state, and federal politicians. This is because many union leaders want to avoid conflict with Democrat Party tops who, in turn, want to avoid conflict with their business backers who, in turn, defend poverty wages to maximize their profits! The potential to build powerful grassroots campaigns for $15 is shown wherever strong, politically independent campaigns like 15 Now or left-wing union locals have taken the initiative. In Seattle and San Francisco, pressure from below pushed virtually the entire labor movement to back $15 and win historic victories. The three strongest campaigns for a $15 an hour minimum wage today – in Oregon, Minneapolis, and Philadelphia – were all initiated by 15 Now. All three are gaining significant union support. Campaigns for a $15 an hour minimum wage in Chicago, Los Angeles, and other cities also made important headway after SEIU and other unions swung behind them. These local examples show the huge potential to build a unified national campaign for $15 an hour minimum wage in every city and state, and at the federal level. Making this a reality will require building strong independent grassroots campaigns, as well as pressure inside the unions, to demand that the full resources of the labor movement are thrown behind this effort. Just as the call for the 8-hour day helped inspire the early labor movement, today the fight for $15 could bring a whole new generation of unorganized workers into struggle.